My tech discussion with Simon Morton and Rowan Quinn on Summer Report this morning centred on the increasingly convincing rumours circulating about the looming arrival of a tablet computing device created by Silicon Valley giant Apple. Plans for an Apple tablet: Etched in stone? MacRumours, Wired and Tech Crunch are all reporting that Apple registered the islate.com web domain back in 2006 and that “iSlate” was registered as a trademark by a Delaware listed company both in the US and Europe. Another Delaware company (Delaware has the tightest confidentiality provisions in the US which is why the majority of companies are registered there) is called iGuide Media LLC and has attracted attention because some of the company documents carry the name of Regina Porter, Apple’s senior trademark specialist. – Will have a high-resolution screen to display high definition video and will be able to display electronic ink – rather like the Amazon Kindle, but in colour. – Will debut at an Apple event on January 26 in San Francisco and begin shipping from March or April. – Ebook sales will be available through iTunes and applications designed for the tablet downloadable from the Appstore. 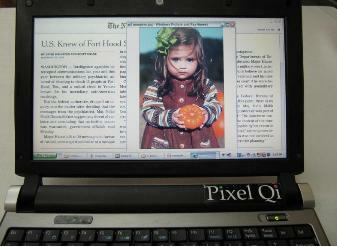 Pixel Qi - e-ink, in colour with video. Is Apple a customer? All of that sounds very plausible and a logical new direction for Apple given the burgeoning interest in ebook readers and slate-like devices for displaying digital content. But the reason for the Kindle’s success is that it allows you to read a book on a digital device without the eye-straining and headache-inducing results offered up by illuminated and backlit LCD screens. The Kindle and Sony’s e-ink makes ebooks easy on the eye. So how can Apple better this using conventional LCD technology and attempting to offer up a screen that will do both high-resolution video and text that replicates the look of a book’s pages? The readability and legibility of our new screens rival the best epaper available today. What’s new about our screens: fast video rate update (refresh), and fully saturated color at low pricing because we use standard manufacturing materials, processes and factories. Our screens use 1/2 to 1/4 the power of a regular LCD screen, and when integrated carefully with the device can increase battery life between charges by 5-fold. You can use our screens in laptops outside in bright sunlight. Look for this dramatic power savings in 2010. So e-ink, colour display, video, embedded mobile connectivity and the power of deliver mechanisms like iTunes and the AppStore sound like a pretty good combination for Apple – if it can pull it all off. The route to premium content? The hardware alone is a fairly exciting proposition, but after the iPhone and the Kindle, hardly something that will have people worshipping at the feet of Steve Jobs as they have done in past product releases. What’s really exciting about the potential release of a tablet from Apple, is how it could change the media landscape. Apple is very powerful in the content business – it was one of the key companies that legitimised music downloads through the iTunes store, despite its tussles with the music industry. Could it do the same for magazine and newspaper publishers desperate to make the premium content model work online? With a rich content device like an Apple tablet that due to its mobile connectivity, knows exactly where you are, content could be delivered tailored exactly to the user’s needs. And don’t just think “print” content. There’s no reason why TV and movie content couldn’t be streamed to the tablet as well. Amazon is already experimenting with bundling newspaper subscriptions with the Kindle. Apple would seem to be in a prime position to take this further by striking deals with content publishers to bundle subscriptions with the sale of the tablet, Apple and the publishers splitting the revenue. 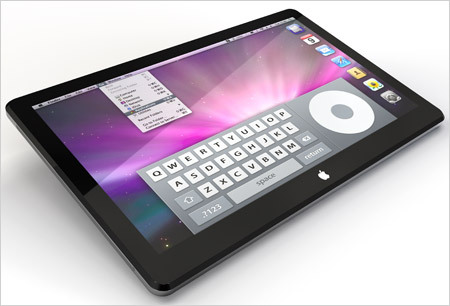 The speculation about the Apple tablet has reached fever pitch, pumping up Apple’s share price in the process. There’s enough credible evidence to suggest a tablet-like device will debut early next year. What will its impact be? Will it change digital publishing. And more importantly for New Zealand, which missed out on the Kindle when it opened up to international sales, how long will the Apple tablet take to reach our shores?